From the lawyer-published "Healthcare Compliance Blog:"
1.Continuing its efforts to deal with providers in an open and collaborative manner. 2.Notifying more hospitals that they are under investigation relating to ICD billing. 3.Making additional inquiries of hospitals regarding this matter. 4.Investigating doctors who have patterns of high ICD implantation rates, coupled with a potential lack of medical necessity. The medical necessity issue poses risks to both physicians and hospitals. These are not really hard predictions to make, though I would argue that the DOJ has been anything but "open and collaborative" as they have imposed a gag order on the Heart Rhythm Society during their current investigation. But we must acknowledge there are implanters who have scammed the system and they should be held accountable for their actions. But for the myriad of physicians who are implanting devices appropriately, no one quite knows what to do with their patient's since the government's CMS-directed guidelines are so out of date. As I mentioned before, CMS wants doctors to use their ICD guidelines based on data from 2005 that ignores the more recently published (and less restrictive) guidelines published in 2008. We are now seeing the Draconian and covert methods that will be used to impose restrictions on our patient's care. This model will serve the government operatives for other expensive technologies, too, like hip replacements, spinal fusions, and the like. Whether the government begins to prosecute doctors for using the newer ICD implantation guidelines remains to be seen, but the mere specter that they're looking has already achieved the government's goal since no one wants the expense and notariety of a legal investigation to contend with and as a result, ICD implantation rates are currently dramatically reduced. But that doesn't mean there's no place for collaboration among competing entities. ThedaCare and the other two healthcare biggies in Oshkosh – Affinity and Aurora – have found several ways to join forces to strengthen everybody's bottom line. Whether it's Aurora and Affinity combining their cardiology departments to ensure top level care for patients of both hospitals, or ThedaCare, Affinity, Aurora and others working together at the Living Healthy Community Clinic at 510 Doctors Court in Oshkosh to provide medical care for the poor, these collaborations make sense. 'We just realized both our organizations expect to take good care of people. We'd identified gaps in services. That's how the cardiology cooperation came about between Mercy and Aurora," said Bill Calhoun, president of Mercy Medical Center. "We questioned why do we compete when cardiologists are hard to find? We decided to do this on behalf of patients. At the end of the day it makes sense," Calhoun said. It will be interesting to see how long these cardiologists continue to "collaborate" before either limiting their practice or burning out and moving to new pastures. Despite what the corporate spin might be, "gaps in service" still need people to provide quality service. Spread 'em too thin and you'll still have "gaps in service." The SustiNet program would create large pools of people, including those who can't currently afford health insurance, that would theoretically drive down premium costs by competing with the plans of private insurers. Among other cost savings, it would designate a single doctor or practice for each patient, to reduce emergency care use, and create new "best-use" procedures for a variety of ailments to reduce the number of tests doctors order. But a key provision of the plan was that doctors, in return for following the new procedures and ordering fewer tests, would be protected from malpractice suits if the outcome of a case was not favorable for the patient. However, with backing from the Connecticut Trial Lawyers Association, that provision was removed from the SustiNet bill two weeks ago. Cardiologists are considered a particularly important group for the new best-use procedures because they tend to order a battery of expensive tests when patients show signs of heart trouble. If specialists like them failed to participate in the SustiNet program, cutting medical costs could be more difficult. On Tuesday, the Connecticut chapter of the American College of Cardiology withdrew its support for the bill and said that it would circulate an open letter to House Speaker Christopher G. Donovan and Gov. Dannel P. Malloy saying that it could not support the bill without the malpractice protection. As screws continue to get tightened on doctors' ability to order tests thanks to third-party oversight bodies, look for more physicians to play hardball about liability limits at both the state AND national levels. Doctors are being forced to do do their part to control health care costs as a result of our increasingly government-controlled health care initiatives. It's high time for the trial lawyers' to do the same. And there's already precedent to doing so: just look to the legal protections military doctors enjoy when caring for their members. While legal recourse still exists in the military, the challenge of suing the government on behalf of their employees thwarts frivolous claims. Imagine: a large stent development company places their new stent in the hands of a clinical investigator. The clinical investigator does the early cases with a new stent, but the results of the study run counter to the company’s expectations. Those problems are reported at a national meeting. The stent company isn't happy that things didn't turn out the way they had expected because they believe the problems identified could be explained away on other grounds. Why, not only do they bring suit against the doctor and hospital that did the study, but they also decide to announce their suit in a press release published to every news organization around the world. While I do not know the circumstances surrounding the case, I find it ironic that the company is suing for defamation, when they, themselves, have just electronically done the same thing: defamed the doctor and the hospital in question before trial. Maybe the doctor didn't want to adjust the results because he believes in his assessments of the complications in this study. Maybe the heavy-handed efforts to discredit his findings are a result of the company's strategic development goals. Then again, maybe the investigator did screw up - does that mean they should resort to a press release and suit? What have others found with their device? Assigned to formally comment on the study after Cervinka's presentation, Dr Jeffrey J Popma (St Elizabeth Medical Center and Harvard Medical School, Boston, MA) observed that the study was small but strengthened by "meticulous attention to details, standard clinical, angiographic, and [intravascular ultrasound] IVUS definitions, and concordance of anatomic and clinical end points." So, he said, "the results are quite believable. And although the conclusion was that this study was just too small to demonstrate clinical benefit, I think it's too large to dismiss the stent thrombosis that occurred following placement of the Genous stent." ... run, don't walk, away from these guys. It was beautiful sunny early Spring day, a Saturday as I recall. Trips were made to various stores to purchase items for school, then a last minute dash to the electronics store so I could pick up another charger for my cell phone. I ran ahead, my daughter and wife lagged behind, weary from the day's outing - at least so I thought. I stood in line to pay for the charger, when both my daughter and wife came up to me smiling - not a pleasant smile - more a mischievous one. My daughter looked up at me. "Dad, you won't believe what I found!" The thoughts circled in my head: a new cell phone? Computer? Maybe a DVD? What? "You have to be very quiet, and don't make any sudden movements. Promise?" she asked. Not knowing better, I nodded agreement, puzzled as to her intent. Slowly, carefully, she withdrew the sleeve on her fleece coat to reveal the tiny treasure she had found outside: the head of a tiny bird - a small wren - with a beautiful iridescent gold stripe above each of its its tiny dark, terrified eyes. She covered it again. "I found it outside, Dad, as we were coming in. I think it hit the window, it can't move its legs. We can help it, can't we? I was worried a dog would get him or something, Dad. We have that old birdcage..."
I looked at my wife. There was that less-than-reassuring smile again. "Um, well, I suppose. You'll have to look up how to feed the poor thing..."
And so I payed for the charger and we hurried home. As I drove, I remembered a similar scenario with a bird I had found as a child. We lived in the country then, and sparrows were plentiful, as were picture windows. My mother must have felt the same way as I had felt in that store when I came to her with my own tiny find as a boy. She was more mature, understanding, and had seen these situations before. Yet she helped me care for my tiny friend with all the anticipation of the Great Recovery that was sure to follow. My terrarium was turned into a makeshift veterinary hospital: plenty of water for the bird, seed, grass all around, even soft laundry lint to serve as a soft bed for tiny patient. A small lamp was placed over the terrarium to provide warmth - surely, this should help, I thought. So I waited and watched - even inviting my friend over to see the infirmary. The novelty of the captive patient generated plenty of excitement about the potential for helping the tiny creature, even though I was never quite sure what I could really do to fix the underlying problem. It didn't matter, I've come to learn. It didn't take long to realize my first patient wouldn't eat. It couldn't drink. I tried eye droppers with water and milk-soaked bread to no avail. Only tiny bits of scrambled egg held in a tweezer garnered a bit of interest, but even then, only briefly. It was difficult, I found, to clean the one tidy cage without terrifying the little guy. I grew saddened and frustrated as I realized the likely outcome. One thing led to another and, despite my very best efforts and perseverance, I later found my tiny, helpless, and winged patient lifeless and still. But my daughter didn't need to hear this story then. It was not time. We had too much to do to prepare for the next Great Recovery, and like me, more enthusiasm, care, love and tenderness were soon to be showered upon that tiny baby wren. As I reflect of that experience as a boy, and later again with my wife and daughter, there was much to be learned from the experience of caring and offering compassion, one that mothers seem uniquely gifted at imparting to their children. Mothers are special that way. My mother showed me the importance of caring first-hand, never flinching even when the odds are stacked against you and your tiny aviary friend. And now, almost ironically, I find my most special 85-year-old wren is fighting to recover from a fractured ankle in a terrarium-like rehab facility far, far away. Strange food. Strange people. Strange sounds. One day blurring to the next. And hopefully soon, around the corner, the next Great Recovery. Can the Government Keep Up With New Guidelines? In case people are wondering if our governmental overlords really care about the latest and greatest treatment guidelines published by our professional health care organizations, take note. CMS (Center for Medicare and Medicaid Services) is still using guidelines for defibrillator implantation from 2005 to justify payment for services in their national coverage decision, whereas the latest guidelines published by the Heart Rhythm Society published in 2008 carry signficiant differences in their recommendations for appropriate patients for this technology. So which set of guidelines should doctors use? The answer is obvious: if you use the latest data to decide who should receive a defibrillator, you might be subject to a Department of Justice investigation. So much for using updated guidelines. It was the early 1980's, budding minds eagerly awaited their clinical years in medicine after two grueling years pouring over books, workshops and cadavers. Gone were the fumes of formaldehyde replaced instead with the pungent smell of penicillin-infused carpets where nurses had primed IV lines. Teams of residents, medical students, and the omnipotent attending rounded from room to room - everyone knew who was in charge. But back then in academic medical centers, there was an interesting twist: residents wrote all the orders on their patients. It was part of their training, to be sure, but also a critical requirement for proper patient care and communication. "Too many cooks can spoil the broth," we were told when it came to discussing complicated care plans with patients. Senior resident and attending worked together much as a commanding officer and executive officer do on board ship, so all consultation recommendations were either agreed to or rejected by these ultimate arbiters and coordinators of care. Now fast forward thirty years in our new era of dispersement of information, location, and personnel: the era of the electronic medical record. Today, care can be rendered anywhere, my anyone. Increasingly we've seen the erosion of the "primary care giver" and the exploitation of a strange new concept: a "medical home" or "medical team" model. Who is in charge at any one time or episode of care is uncertain. In fact, the term "consultation" has vanished from our lexicon of billing codes in favor of a more ubiquitous designation of "level of care" and with it, any semblance of understanding of who's recommending care and who's delivering it. Increasingly, if a specialist feels strongly that an order should be performed on a patient, he is expected to write the electronic order rather than recommending it be performed. With that move, all other care-givers are out of the decision loop and instead, mere information consolidators. Suddenly no one is responsible, yet thanks to the wonders and permanence of the electronic record, everyone's responsible. Many argue that since two heads are better than one, then many heads must be better than two. But for a moment, imagine the potential disasters what could happen if the Navy ran their ships that way. Every day, doctors do risky things for their patients, often because they have no other options. Today is such a day for me. I don't know how it will go, and because of privacy laws I really can't tell you about the case, I'm sorry. (Nor will you get an epilogue, that's not the point of this post). But let's just say that any normal person would consider the case I'm about to perform very high risk because of the patient's condition. Even though you tell people they could die and take care to mention that fact time and time again, you wonder if they really can comprehend the significance of what you're saying - after all, there is a fine line between being reassuring in a time of crisis and telling it like it is. I've spoken with the family and kids at length, I've answered their questions, I've even asked that only one of them serve as a spokesperson for the entourage of family members who have come to the hospital and flown here for this day. And yes I've documented, documented, documented. I can only hope everyone knows how serious this is. Certainly the patient does. But I also realize I assume a tremendous risk professionally doing this procedure. I've done what I feel is everything short of today's procedure in the hopes it could be avoided, to no avail. I've amassed an army of individuals to help. Monitors and medications will be assembled to counter every contingency, but there will still be the possibility that something will arise I have not considered. Most of us would rather be doing something else, but all realize there's few options than to proceed. I know I'm not unique. This happens all the time in America in hospitals big and small: where doctors are pulled into circumstances like this as reluctant dragons, with a patients who trust in them to such an extent they'd have no one else do it but you. I hope and pray that all goes well. But as hard as this is, I wished like hell I didn't have to worry about the 800-pound gorilla who'll be in standing in the corner watching me today. And trust me: every doctor in America knows who that is. How Independent Are Our Peer-Reviewed Scientific Journals? 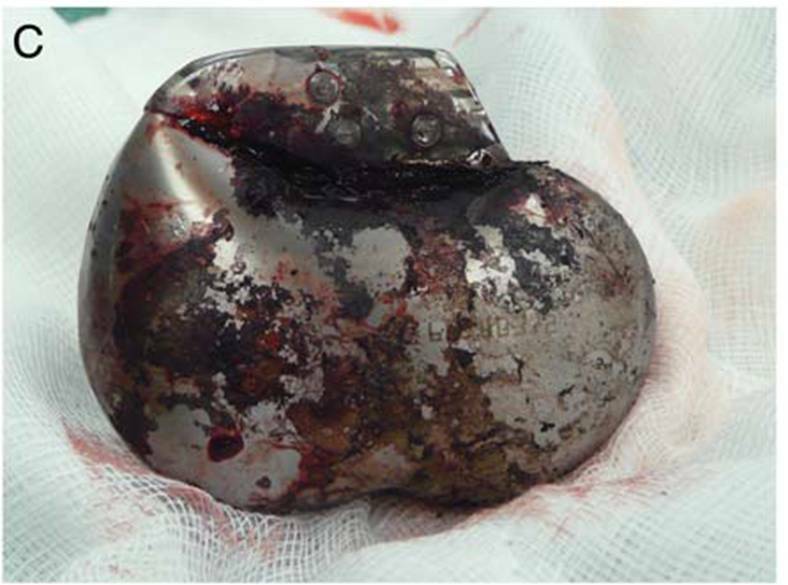 On September 27, 2010, the peer-reviewed scientific journal Europace published online-before-print a case report entitled "Spontaneous explosion of implantable cardioverter-defibrillator" by Martin Hudec and Gabriela Kaliska. In the pdf of that case report a figure containing a color photo of the affected patient's chest, chest xray, and two pictures of the extracted device (one seen here) were included. The pictures and case presentation were dramatic. The case very rare. Both were perfect reasons to report such an important case to the medical literature. And so these doctors sent the case to Europace on 29 June 2010 and the article was accepted after revision on 16 Aug 2010 with the article appearing online 27 September 2010. The authors must have felt very proud to have an article published relatively quickly and the editors and reviewers of Europace must have thought the case was unique enough and important enough to have the article revised according to their specifications, then published online. Until I reported the case on this blog 5 October 2010 and included images from a portion of the case report's figure. What I see happening is some kind of media sensation being created without the facts. (ed note: this blog, a media sensation?) This concerns me because my only intention was to share a rare experience that would hopefully help my colleagues to more fully understand the possible complications that can occur, even if rarely, with such complex technology. So, please allow me to give you the information that you are missing. The term "explosion" is not accurate. After talking to engineers the more appropriate word would be 'venting' of the battery. The shape of ICD was distorted, but not ruptured in any way. Furthermore, I have described what I believed was the first such a complication published, there are more reports about battery overheating which I got to my hands but not published in medical journals. These malfunctions are extremely rare and very unfortunate, however any device from any manufacturer could and has had such complications. This information is important to put the report into the appropriate context. Astoundingly, on 8 October, just three days after my original post, I met with Biotronik representatives eager to make sure I had their "internal company memo" with the facts regarding this case that I could use with their permission on this blog. To be fair, Dr. Hudec has repeatedly stated that it was his decision alone to withdraw his case report and not Europace's editorial board. Eventually the dust settled, but many questions remained. I learned that the revised case report was published online again on 17 February 2011 in Europace! Somehow I had missed it. Now we find the term "exploding" has been replaced with the term "heat dissipation" in the revised case report's title: "Case report of out-of-hospital heat dissipation of an implantable cardioverter-defibrillator." Chest radiography displayed signs of pneumomediastinum and deformity of the ICD housing. A subsequent ultrasound of the left thorax identified a small pneumothorax. Interrogation of the ICD was not possible and the device was explanted within 5 h of the event. 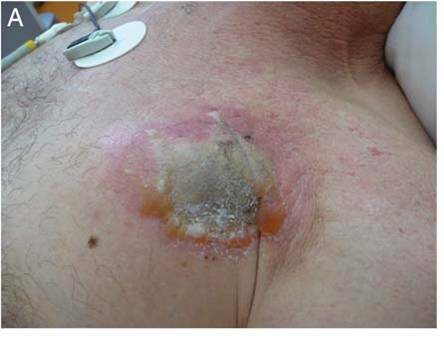 Burned necrotic tissue was observed on the device surface and along the internal aspect of the pectoral pocket. The patient has recovered from the explant procedure without further event." Extensive analysis of the device suggested that the battery had overheated, possibly due to the presence of a foreign particle causing a short circuit. The resulting pressure forced the battery to vent inside (ed: emphasis mine) the ICD housing. What? Inside the housing? Seems the housing of the device ruptured and gas escaped OUTSIDE the housing causing significant patient trauma: how else would this patient have gotten a pneumomediastinum and pneumothorax? And what happened to the possible hypothesis for failure of a so-called "lithium reaction" described in the earlier case report? Finally, in the section of the revised case report entitled "Overview of events with similar characteristics," the authors state that they identified "This and similar isolated cases (without an underlying cause) found in the MAUDE database for the years 2000-2010" and summarized them in a table. The table noted that three of the 10 cases had an "Audible noise ('pop') excluding notifier", three had "Damaged housing, battery, or subassembly", nine of 10 had "Burns or burning sensation" and two resulted in "Death/external rescue required." Not a single detail regarding the manufacturers, models, clinical circumstances of the ten previously-identified cases or specific FDA MAUDE report numbers were provided. Instead, a link to the FDA's MAUDE database search page was included in the references. You'll have to find the cases yourself, I guess. Implantable cardioverter-defibrillators are produced under strict regulatory and manufacturer quality controls. There are over 250,000 ICDs implanted worldwide each year, documenting a high level of established reliability. Clinicians implanting ICDs should be aware of the possibility that a normal risk of malfunction exists, however is far outweighed by the advantages that are gained from this state of the art therapy. Ahem. Aren't case reports about a person and not a device? Are doctors unable to advocate for their patients for fear of upsetting the medical device industry? Is the conclusion really that "cardioverter-defibrillators are produced under strict regulatory and manufacturer quality controls?" Or is the real story here that independent scientific peer-reviewed journals might not be so independent after all. Give me your medication list and I'll tell you your health problems. It happens every day in emergency rooms across the country as confused elderly patients present for an acute problem unable to describe their past medical history but equipped with a list of medications in their wallet. I bet I'd be right better than 90% of the time. Now, imagine you're a pharmaceutical company wanting to target people with those chronic diseases. Where might you find them? No problem. Just pay the insurers to provide you patients drug lists. No names need be exchanged in keeping with HIPAA requirements. But the drugs list attached to folk's cable TV box? Perfect. You're in. With no legal strings attached. Then just fire away with that targeted direct-to-consumer advertising on TV, courtesy of your local health care insurance provider. No wonder our health care industry movers and shakers love the electronic medical record. Health care privacy? What health care privacy? Make 'em be doctors and lawyers and such. Well, I tried to do what Waylon and Willie suggested. But one's becoming a musician instead. As I listened to him play the first movement of Schubert's String Quintet in C Major (he's second cello on the left), I was struck to find that two of the five musicians in his group were the kids of doctors. I'm not sure if this means much, but it was an interesting observation. But I wonder if their tilt toward music as a vocation occurred because of what they saw from their parents as they grew up: the work hours, call, and frequent absence during their formative years. It certainly isn't because they weren't smart enough. It was another tragic story of a young 16 year-old high school athlete collapsing suddenly after winning a championship basketball game. An autopsy discloses a dilated cardiomyopathy. People wonder: could this happen to my son? The cries for screening to catch such cardiac disease before it manifests are raised. Hospital systems respond, ushering in free or reduced-fee screening electrocardiograms for all student athletes, arguing that such testing would likely capture heart trouble before it happens. In the past two and a half years, the hospital has examined 5,200 students at Healthy Heart Checks held regularly around the Detroit area. The screening includes a medical history, blood pressure check and an ECG. About 15 to 20 percent of the students also undergo an echocardiogram. Through the screenings, the doctors found three students who had serious underlying structural abnormalities of the heart that could have led to sudden cardiac arrest, Haines said. About 30 students had conditions that were serious enough that they were advised to stop playing sports -- though in some cases, they were able to resume sports after undergoing treatment. Unfortunately we don't know much about the later 30 students: did they require additional invasive procedures, like radiofrequency catheter ablation of an accessory pathway and what were the costs involved? We really don't know these students' circumstances, so, in the interest of simplicity, we'll leave them out of our analysis for now, but should assume they added even more costs to the overall screening cost. In summary, we find from this article that 5,200 EKG's were performed at a "reduced rate" of $8 each (doctors and volunteers' time was donated for free), "15-20%" then went on to an echocardiogram (we'll use 17.5%) to find three "true positive" cases of a heart condition that could potentially result in SCA. The inability to detect the severe cardiac disease with an EKG alone meant that the EKGs had a "false positive" rate of about 17.5% (minus the three "true positives"). In real numbers, about 907 echocardiograms had to be performed as a result of the screening program. What does this mean financially to the hospital? If the cost of this testing were paid for from fees or insurance payments, assuming a conservative estimate of $500 per echocardiogram for the technical fee to do the study and another $200 for the professional reading of the echocardiogram, a cool $634,900 was garnered for this test alone. And don't forget the costs for office "consultations" to discuss the findings and the other invasive or imaging tests that might be required "just to be sure." Very conservatively, this relatively small screening program cost about $676,500. Armed with the data, we should ask if the costs were worth it so, as their athletic director said, we can all "breathe a little easier and sleep a little better knowing that all of our student athletes are safe?" Costs and known false positive and false negative problems with EKGs is a large reason screening programs were not recommended recently by the American College of Cardiology. Rather EKG screening was only recommended if a person's medical or family history suggested a higher-than-normal chance of finding a problem. But it is much easier to want to do things proactively when tragedy strikes and far harder to do nothing: everyone wants to feel like their doing what's best for their child or loved one going forward. But our need to "sleep better" after such a tragedy should be balanced with the keen appreciation of the relatively low frequency of the problem in our students and the costs to our health care system for this reassurance. Nothing in medicine is "free" these days, no matter what health care systems may suggest in their promotion of these programs. Take a moment as ask yourself if there might be teenagers who die from a cardiac death despite having had all of these tests? Very possibly. But it's unlikely that such a story will ever make the headlines. That's because such a story of the false negative rate of all these screening tests might be very bad for business. 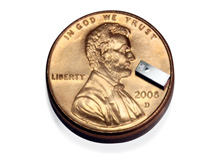 A Pacemaker on a Chip? So far, Medtronic has developed most of the components—a circuit board, an oscillator to generate current, a capacitor to store and rapidly dispense charge, memory to store data, and a telemetry system to wirelessly transfer that data. The company has used chip manufacturing technology to assemble these components onto a wafer. Oesterle estimates that 60 to 70 pacemakers can be made from a single six-inch wafer, which the company creates at its own wafer fabrication plant in Arizona. "What we don't have that is fundamental to a pacemaker is a way to power the chip," says Oesterle. The company is working with startups that make thin-film batteries and other innovative power sources, though Oesterle declined to give further details. Oh, and don't forget the need for a fixation mechanism. Otherwise, these things might embolize and serve as the next Viagra.